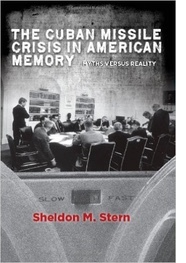 Dr. Stern is the author of numerous articles and “Averting ‘the Final Failure’: John F. Kennedy and the Secret Cuban Missile Crisis Meetings” (2003), “The Week the World Stood Still: Inside the Secret Cuban Missile Crisis” (2005), and “The Cuban Missile Crisis in American Memory: Myths vs. Reality” (2012), all in the Stanford University Press Nuclear Age Series. He was Historian at the Kennedy Library from 1977 to 2000. This is the seventh in a series. Click HERE for previous installments. The U.N. ambassador surely sensed that the ExComm was stacked against him: McGeorge Bundy, Douglas Dillon, John McCloy and John McCone were Republicans; RFK had worked in Stevenson’s 1956 presidential campaign, but after becoming convinced that the Illinois governor was weak and indecisive had actually voted for Eisenhower; JFK himself, never forgave Stevenson’s quixotic effort to pull off a third presidential nomination at the 1960 Democratic convention. The ambassador himself had not forgotten being misled into showing falsified CIA photographs at the UN in a failed Kennedy administration effort to conceal the American role in the April 1961 Bay of Pigs invasion; the antagonism in the room directed toward Stevenson was almost palpable. Stevenson had first suggested a possible missile trade when he had conferred with the president on October 17th—the second day of the crisis. But, in the entire 13 days of discussions, the UN ambassador was the only ExComm participant to raise Khrushchev’s central argument for the deployment of Soviet missiles in Cuba: that they were intended as a defensive effort to protect Castro and his government from the Kennedy administration’s secret war and a second attempt to invade Cuba. Stevenson soon left the meeting to take a phone call from an aide at the UN. (One can only imagine the mixed emotions experienced by the twice-defeated presidential candidate, who took the call alone in the Oval Office, perhaps sitting at the president’s desk.) With the ambassador out of the room, JFK bluntly declared that “nobody’s very much interested in” Stevenson’s proposal. Robert Kennedy, in Thirteen Days, later claimed that JFK rejected Stevenson’s recommendation for a Cuba-Turkey missile swap. Ironically, that is exactly what the president did the very next day, over the objections of virtually the entire ExComm. Just weeks later, a magazine article, almost certainly the result of a leak from one or both of the Kennedys, charged that Stevenson had advocated “a Munich” at the October 26 ExComm meeting. The report squared perfectly with the emerging administration cover story that the president had rejected a Cuba-Turkey missile trade and had forced the Soviets to back down.